Blog What is an Autoresponder? …and why should you care? We spend quite a bit of time preaching the value of building up a prospect list that can be quickly and easily marketed to. There are various ways to do this, and the mechanisms are growing by the day – Facebook “likes”, Twitter followers, RSS feeds, etc. You need to be familiar with some of these channels as well (keep an eye out for future posts), but at the end of the day, plain ol’ email marketing still dominates. So to finally answer the question posed above…an autoresponder is a service that will help you easily build an email list of your prospects, and allow you to send out a series of emails. You write them in advance, and schedule them so that you can send, for example, a “thank you for visiting” (if you captured her email address) message immediately, and some valuable content the following day to reinforce the fact that the visitor should open and read your emails. Then maybe you wait a few days before sending another email with great content, and at the bottom tie it in to a procedure you specialize in or a product you offer – GENTLY. The wonderful thing about an autoresponder is that you do the setup work once (creating the “opt-in” form for your website and creating and scheduling the emails), and then this silent salesperson helps to nurture the relationship with your prospect. As you’ve probably heard many times, people buy from people they know, like, and trust. Consistent email communication, which builds your expertise and value and trustworthiness, does most of that job for you. When you consider that most of the services that “host” your autoresponder service for you charge $20 – $30 a month for average-sized lists, you can’t possibly decide not to do this! Do you think that building a relationship with your prospects automatically would help one or two of them schedule a procedure in a month? What’s your average lifetime patient value? Let’s say it is “only” $2500, and you only get one new patient a month. Hmmm… Spend $30 to make $2500 – sound like a good deal? I could stay on my soapbox about this for a long time, and if you’d like a bunch more info on this, leave a comment below or call us – yep, a real live phone that gets answered. But instead of me preaching, I’ll wrap it up with this recent information from SeeWhy – a company that works with large eCommerce websites. As with most, this study isn’t perfect because it can’t possibly track the entire process, and we don’t know every detail about the study. 56.8% of the people that made it to the shopping cart came from an email sent by the company. Wow. 4.3% of the shopping cart traffic came from Social Media. 67.4% of the conversions (completed sales) came from the email visitors. Now before you start screaming that this is a completely unfair comparison…I agree with you! A medical practice isn’t an e-commerce site, and there is a huge difference in somebody on a practice’s email list (typically either patients or at least qualified prospects) compared to somebody that was looking at pictures of Justin Bieber on their friend’s Facebook feed and then decided to click over to your Facebook Page. And that’s my whole point! Get people on your email list who are decent prospects (see my P.S. below), then nurture them the right way, and most likely they will eventually buy. P.S. Before you accuse me of being out-of-touch with the world of social media, just as above, I’ll agree with you again. Social media is a phenomenal opportunity. There’s nothing like the potential of having your message re-tweeted to thousands or tens of thousands of people by some big shot that follows you on Twitter. Same thing for Facebook and many other sites and techniques like mobile marketing. So…get people to your site using social media or one of the hundreds of other techniques out there. But then focus 100% of your effort into “converting” them into an email list subscriber. 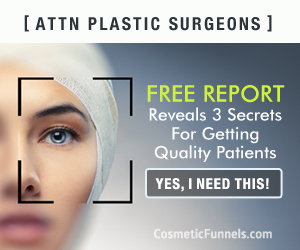 Converting them is beyond the scope of this post, but this is best accomplished by offering them some kind of valuable free report with “secrets” you’ve learned over the years as an expert in your specialty. We also call this an “ethical bribe” – you are bribing them into handing over their contact info by offering them something so compelling they can’t say “no”. So don’t go for the sale. Don’t even go for the sale with some amazing discount. Don’t offer them a free consultation. Just get them on your email list, and nurture the relationship until they can’t wait to schedule! In general, you’ll get website visitors to your site and use your wonderful freebie to get them to “opt-in” – to your prospect list. At that point, they are part of your “prospect” autoresponder series, designed to build trust and convince them to take the first step and schedule a consult, or at least make a phone call. Once they do have a procedure, you’ll configure your autoresponder so that they are removed from your prospect list, and added to your “patient” autoresponder series. You can (and should) talk a little differently to your patients, hold patient appreciation specials, etc., so it really is worth it to segment your lists in this manner. However, at the end of the day, could you leave a customer on your prospect list and not have the world end? The important part – like most of the stuff we talk about – is taking action and getting the autoresponder setup, and get your automated sales robot working for you.